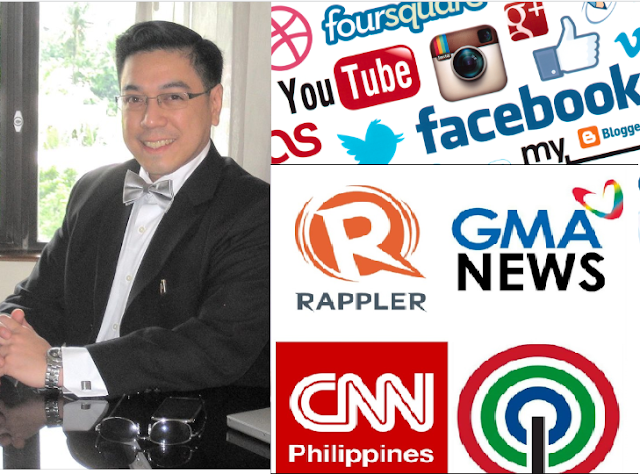 In one of his Facebook post, Ateneo de Manila alumnus and Federalism advocate, Orion Perez cited a lot of significant changes social media has contributed for the country’s political aspect. In a lengthy post, Perez pointed out how social media revealed secrets that mainstream media - particularly oligarch-owned mainstream media - refused to carry. Mainly, reading his post would make you really compare how the people were so dependent on the traditional news sources like radio, TV, and newspapers, with no ways to hear the different side of the story, to air your own opinion and even no ways to tells your story. Back in the old days, information flow was one way... We just got the news from traditional sources like radio, TV, and print. We would read stuff that didn’t make sense and we could only shout back at the TV screen, or radio and mumble at the coffee mug while reading the newspaper, etc. We could write to the editors but it took so much time. Most letters to the editor never made it to the editors. Cory was portrayed as a saint, and there was pretty much no way to present the other side as the narrative was controlled by one group with an agenda. Who would have thought that more and more people would end up becoming much more inclined towards adopting the Parliamentary System when back in the 1990s, it was thoroughly demonized in mainstream media back then? It’s so easy to fight back now. In fact, social media is changing the general narrative from one which used to thoroughly lionize the Yellow Narrative and totally and almost completely demonized the Marcoses. Today, that has all changed except for a few small pockets of elitist echo chambers. In many cases, the blowback was extreme. Ex-Yellows who used to wear Yellow and hated on the Marcoses have now become diehard anti-Yellows and wouldn’t mind having Bongbong Marcos as the VP and even voted for him as VP in 2016. This is what happens when one side abuses the ability to control the narrative by trying to sell a totally substandard product and pass it off as the greatest. It has become such a pathetic hollow shell of its former self that key keepers of the Yellow Narrative have stopped wearing yellow on “EDSA 86 Day” and have gone on to wear either black or at other times, white. Yellow is out, and the Yellow Narrative is dead. The Yellow handlers who made that huge blunder of getting Noynoy to run for President are responsible for why Bongbong Marcos performed very well in the 2016 elections and why there is enough reasonable suspicion to think that there was a conspiracy to prop Leni’s numbers up and why the electoral recount has numerous times involved ballot boxes getting soaking wet and ballots having poorly-shaded selection boxes in areas where Leni is supposed to have won. Social media spread the news that mainstream media - particularly oligarch-owned mainstream media - refused to carry. Of course there will always be fake news. But that’s generally easy to spot. Wrong facts are easy to call out in this day and age of Google-based fact-checking. But hey, you can’t fake photos showing supposedly impartial Election Tribunal staff members fraternizing with Leni’s own election revisor. While it used to be that Mainstream Media used to fool all of us some of the time or would fool some of us all of the time, thanks to Social Media, the Oligarchs can’t continue fooling us at all. There’s Google and the Internet and it’s possible to do fact-checks all the time.